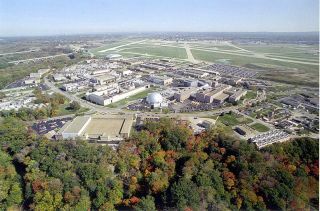 An aerial view of NASA's Glenn Research Center at Lewis Field, Cleveland, Ohio. A new hacking group calling itself "The Unknowns" has published a list of passwords and documents reportedly belonging to NASA, the European Space Agency and the U.S. Air Force, among other high-profile government targets. The group's Pastebin post, released yesterday (May 1), includes names and passwords reportedly belonging to NASA's Glenn Research Center as well as the U.S. Military's Joint Pathology Center, the Thai Royal Navy, Harvard University, Renault, the Jordanian Yellow Pages and the Ministries of Defense of France and Bahrain. Softpedia reports that the hackers also posted screenshots of some of the sites they breached, and that although the post was made public yesterday, some of the hacks date back to March. NASA's Glenn Research Center and the U.S. Military's Joint Pathology Center did not respond to requests for comment by SecurityNewsDaily. In its message, The Unknowns explained the impetus for their exploits, and warned they could have caused much more damage than they did. "Victims, we have released some of your documents and data, we probably harmed you a bit but that's not really our goal because if it was then all of your websites would be completely defaced but we know that within a week or two, the vulnerabilities we found will be patched and that’s what we're looking for." The hackers said they are "ready to give you full info on how we penetrated threw [sic] your databases," and told the affected organizations to contact them. SecurityNewsDaily contacted The Unknowns through the address the group posted, the_unknowns@live.com, but did not receive a response. The Unknown's "hacking-for-good" stance is similar to that of Malicious Security (MalSec), a newly formed Anonymous spinoff that, ostensibly for "ethical purposes," leaked email addresses and passwords from several Romanian banks and government organizations.